Students who plan on receiving a master’s degree in the field of mathematics or secondary education will have the opportunity to live and teach abroad. Partnered with the Peace Corps, the university will begin a program allowing students to continue their education while performing community services in various nations across the world. “Overall, after you’ve been in the Peace Corps, you have a different perspective in life,” said Herman L. DeBose, sociology department chair. “It helped me gain self-confidence in myself and my abilities. DeBose was a Peace Corps volunteer stationed in Kenya from 1969 to 1972. He said his time as a volunteer has been one of the major attributions to the various successes in his life. “It changed my whole life and it gave me a foothold into sitting in the chair of sociology,” DeBose said. Carol Shubin, mathematics professor and coordinator of the program, has been a volunteer in the past and was stationed in Rwanda during previous years. She said her time in the program was an experience like no other. Those who are interested in participating in the program need to go through a three-step process. The first step entails students applying to graduate programs in either mathematics or secondary education. After admitted, applicants must then apply to the Peace Corps International Master’s Program, which should also include a letter of recommendation specifying the maturity and dedication associated with the student. Giuseppe DeVitis, a 32-year-old accounting major, said he would like to have more students participate in a program that offers valuable experiences and gives back to the global community. 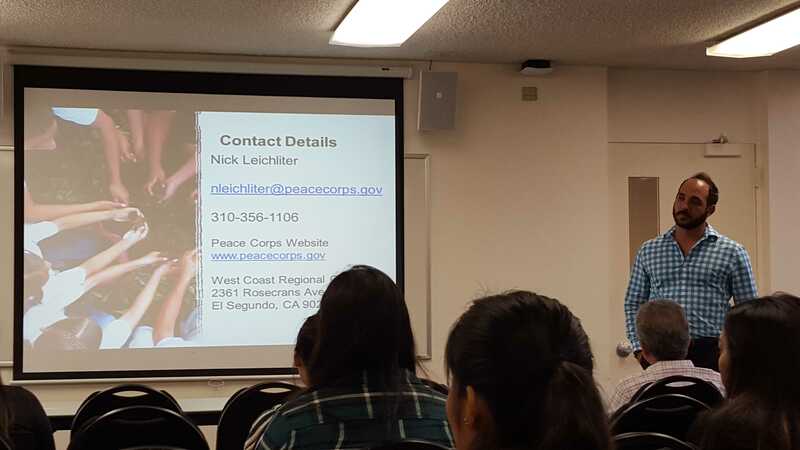 DeVitis, who once worked at a local talent agency, said that during the hiring process, applicants who had Peace Corp experience in their resumes were often called back for interviews. DeBose said service in the Peace Corps was not only an experience that was life-changing, but also a place that led to the foundation of his family. “The Peace Corps put me in contact with the woman I’ve been with since September of 1969,” DeBose said. After spending a semester in Spain nearly a year ago in a study- abroad program, Alex Pilavjian, a 21-year-old business major, said he believes the Peace Corp, like the study-abroad program, will help students become more independent and better acquainted with life abroad. “I think students would become more open-minded, courageous and will eventually learn how to live in a different environment all by themselves,” Pilavjian said. Shubin said she is a huge believer in the value of education and giving basic knowledge of science and health to people. “We’re essentially there to share and often find ourselves learning at the same time,” she said.